A cameraman films outside the Arango Orillac Building that lists the Mossack Fonseca law firm in Panama City, April 5, 2016. Documents leaked from the firm include details of how some of the globe's richest people funnel assets into secretive shell companies. Russian state media continue to largely ignore the Panama Papers scandal, although a Kremlin spokesman has dismissed allegations of Russian President Vladimir Putin's involvement in large-scale money laundering. Russia’s Channel One, the country’s flagship broadcaster, took nearly a full day before making even scant mention of the investigation. Even then, coverage led with a statement by Putin’s spokesman, Dmitry Peskov, denigrating the International Consortium of Investigative Journalists (ICIJ) report as little more than a U.S. government-backed smear campaign. The newscast quickly switched to other investigation findings — those implicating Ukrainian President Petro Poroshenko, a current Kremlin foe, for hiding offshore accounts. President Vladimir Putin’s spokesman, Dmitry Peskov, speaks to The Associated Press in Moscow, April 5, 2016. 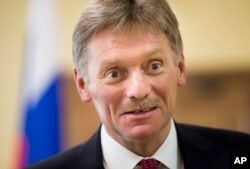 Peskov says the Russian leader has no connection whatsoever to offshore accounts mentioned in the so-called Panama Papers. Yet online and among Russia’s struggling independent media, Russians pushed differing views of what, if anything, the ICIJ report might mean on the Russian political scene. Kremlin supporters were quick to mock the investigation’s findings — which appear to connect Kremlin insiders, rather Putin directly, to offshore accounts — as just another failed attempt to substantiate long-standing rumors of Putin’s alleged secret wealth. “After such an investigation, even the opposition is ready to send Putin money,” wrote pro-Kremlin activist Maria Katasonova. In a separate post, she noted that Putin’s ratings would most likely grow as a result of the investigation, which the Kremlin called an “information attack” against the Russian leader. Leonid Volkov, an opposition blogger, criticized state media journalists for their notable silence in the wake of the ICIJ report. "The investigation has shown the complete absence of shame, conscience and common sense among 95 percent of Russian journalists," noted Volkov in a post to his Twitter account. Others commented that the ICIJ report, while remarkable, had simply scratched the surface of corrupt dealings within Russia. "It's important to understand: This investigation is based on just one Panamanian firm," wrote Russian opposition politician and anti-corruption crusader Alexey Navalny in a post to his blog. "So it's just the tip of the iceberg of offshore holdings by bureaucrats, and just a small piece," wrote Navalny, calling for Russians implicated in the investigation to face possible jail time. Meanwhile, both sides debated the ICIJ investigation’s importance. “What’s the sensation of saying that in the world there exists offshore holdings, that someone gives someone else credit, and that someone put their money somewhere?” he wrote. Ilya Yashin, an opposition politician and frequent Kremlin critic, agreed — to a degree. 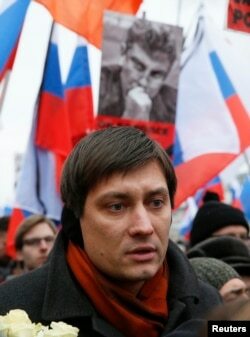 FILE - Dmitry Gudkov, a member of the Russian parliament, attends a march in Moscow to commemorate the death of Kremlin critic Boris Nemtsov, March 1, 2015. Gudkov says exposure of Russian elites' finances had elicited "panic in the Kremlin." But Dmitry Gudkov, a rare voice of independence in the state Duma, insisted that, in exposing Russian elites' shady financial practices, the report had elicited "panic in the Kremlin." "After this, it's clear that no quiet old age awaits the kleptocracy. Their money will be seized, and with it, a widening ring that ends in handcuffs overseas," Gudkov wrote online. Yet it was Volkov, the blogger, who suggested the ICIJ report might prove an ominous development for Russia's own internal politics. Writing on Facebook, he noted that while the elite in other countries listed in the Panama Papers report might face prosecutions, scandals or perhaps even no charges at all, experience told him the news would ricochet in Russia in negative ways: The Kremlin, wrote Volkov, will "launch several criminal cases against the opposition and ban something on the Internet."